Why Math Rocks : 13.7: Cosmos And Culture If you don't look with the right eyes, you don't see how pervasive and all-encompassing math is — it even engenders debate as to whether it goes beyond human invention, says Marcelo Gleiser. Everyone who has kids, or who remembers his/her childhood, will also remember the struggle to understand why math matters. "Who cares about multiplication tables and fractions, triangles and algebra? Why do I need to know these things?" The challenge with math is that if you don't look with the right eyes, you don't see how pervasive and all-encompassing it really is. We somehow detune ourselves from the myriad patterns that surround us, both outside and in. We don't count heartbeats (that would drive most people mad, as you can check in this amazing Radiolab program The Heartbeat. And we don't associate evergreens with cones or tend to analyze the symmetry in people's faces — at least consciously. Yet, all of our gadgets and machines depend on our understanding and ability to apply math to different materials. At a deeper level, much of the natural sciences are about identifying patterns in nature that we then call "laws." These laws usually have some form of mathematical expression, as in Newton's laws of motion and gravity, or the law of conservation of energy. In fact, such laws are so essential to our understanding of the universe that many scientists believe that math goes beyond human invention, being the fundamental language of nature. Others are not so convinced and consider mathematics an invention of the human mind and, to a certain extent, of the minds of the few animals capable of performing basic mathematical operations. The question then, and one that has been argued for millennia, is whether mathematics is discovered (that is, part of a universal language out there) or invented (that is, a language particular to the human mind). This may well be one of these unanswerable questions. A beautifully produced NOVA documentary addressing these issues, The Great Math Mystery, is being re-aired tonight. Anyone interested in this question, or in why math matters, should take a look. With their kids. If you follow Pythagoras, Plato and most pure mathematicians, math is all there is: Nature is indeed a giant network of mathematical expressions and patterns, somewhat like the program that runs a video game. Nobel Prize-winning physicist Eugene Wigner called this the "unreasonable effectiveness of mathematics." Others aren't so sure, and go as far as calling this whole notion some kind of misplaced religious faith. (The astrophysicist Mario Livio's excellent book on the topic is called Is God a Mathematician?) There are many kinds of math, and those chosen to describe patterns in nature or used to build machines form a very small subset. We can invent all sorts of abstract mathematical worlds, such as eight-dimensional spaces and their properties, that are not reflected in reality. Linguist George Lakoff of the University of California, Berkeley and colleague Rafael Nuñez argue that the idea of a universal math is a fallacy: Math is embodied in the human brain and is a direct product of how it evolved in a very particular set of circumstances. Similar brains, as in intelligent aliens evolving on an Earth-like planet, may repeat some of our mathematical findings — but that's due to their brain structure and not to some kind of universal truth being plucked out of an ethereal realm. So, the debate continues. There is no question that there are mathematical patterns in nature, from spirals in hurricanes and sunflowers to approximate symmetries and periodic motions, from elementary particles to galaxies. 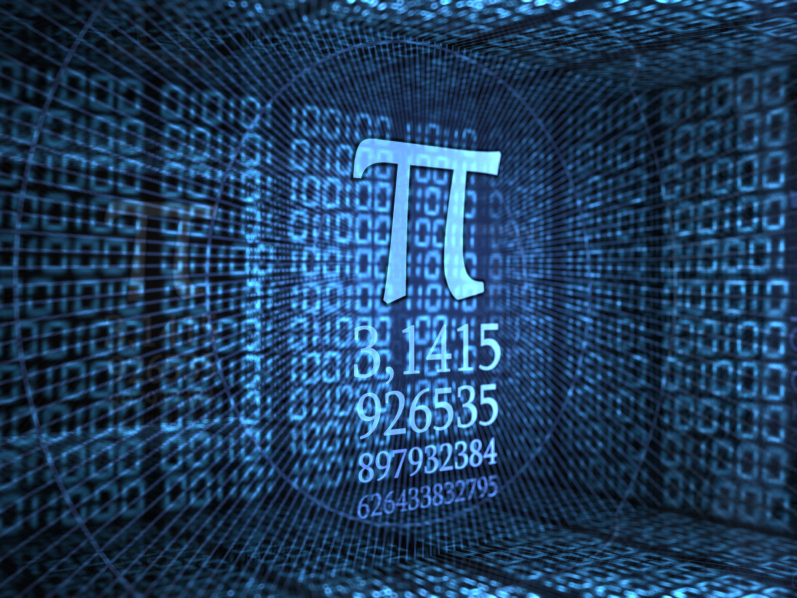 The number pi shows up everywhere, from statistics to wave motion to the equations of general relativity describing the expanding universe and black holes. Our brains are exceptionally attuned to identifying such patterns, an ability that no doubt helped our ancestors survive in their dangerous environments. Could our brains be tricking us into believing this ability is bigger than we are? Perhaps the urge to associate math with a universal language comes from a strong resonance between our pattern-seeking ability and our penchant for believing in something bigger than ourselves. There is huge catharsis in uncovering timeless laws that are bigger than we are. The fact that some of these laws describe reality incredibly well should be celebrated. But the fact that many of our attempts fail or have no relation to the world should also be factored in. Whatever the answer, once we see math as a language of nature, the way we perceive it should change completely. It's no longer about multiplication tables or fractions, but about something bigger than ourselves that we construct with our heads. What could be more amazing than that?